Forest productivity is declining over large areas of managed forest in central Europe (Cramer 1984, Schutt and Cowling 1985), China (Zhang and others 1980), and North America (Bruck and Roberge 1984, Knight 1987, Sheffield and others 1985, Siccama and others 1982, Zedaker and others 1987). In calling attention to this major problem several years ago, the Society of American Foresters (1984a) stated its concern: "In the face of mounting evidence that forest productivity is declining worldwide, researchers know too little about complex ecosystems and the cumulative effect of subtle stresses from atmospheric pollutants." Certainly our knowledge of biological processes and their interactions within forest ecosystems is incomplete, and we know too little about the cumulative effect of a wide range of stresses on the ecosystem. But integrative research at the ecosystem level shows clearly that the many processes operating within forest systems interconnect in important ways (Waring and Schlesinger 1985). Further, diversity of microscopic and macroscopic plant and animal species is a key factor in maintaining these processes (Blaschke and Baumler 1986, Durrieu and others 1984, Li and others 1986, Plochmann 1968, Franklin 1988, Froidevaux 1981). The Congress of the United States addressed the matter of species diversity in the National Forest Management Act of 1976 (U.S. Laws, Statutes, etc. 1976): "...regulations, under the principles of the Multiple-use Sustained Yield Act of 1960...shall include...guidelines which...provide for diversity of plant and animal communities ...."
Elsewhere in the Act, the Congress offers a philosophical basis for constructive forestry goals: " . ..the Forest Service has both a responsibility and an opportunity to be a leader in assuring that the Nation maintains a natural resource conservation posture that will meet the requirements of our people in perpetuity...."
An underlying principle of the congressional direction is that people, as a significant part of the forest ecosystem, have the right and the obligation to manage biological processes to produce products and amenities afforded by forests. Such management, however, must be consistent with the need to maintain health of the biologically productive machinery over the long run. The 1986 "National Forum on Bio-Diversity," sponsored by the National Academy of Sciences and the Smithsonian Institution, was a needed step toward recognition of the problem. Now, forest scientists must be strongly challenged to define the relations between biological processes and forest health. and the open ocean, chapter 4. Intensive and diversified management and the need for future research are examined in chapter 5. Most of the information is specific to the Coast Range of Oregon but also applies generally to western Oregon and western Washington, western British Columbia, and southeastern Alaska. 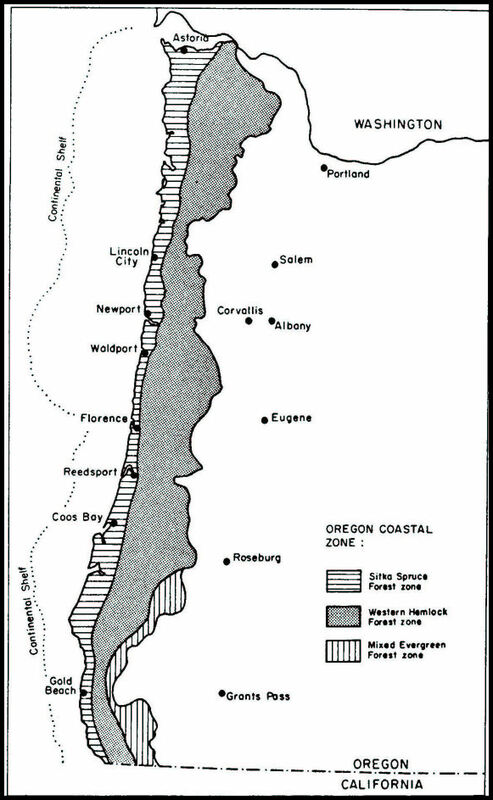 Figure l.1-The Oregon coastal zone. sites composes one macrosystem (Vannote and others 1980). The parts of this system are related by water and atmospheric transport of chemicals and organic and inorganic substances of various sizes along an elevational gradient from 4,000 feet above sea level to an ocean depth of 1,200 feet (200 fathoms). 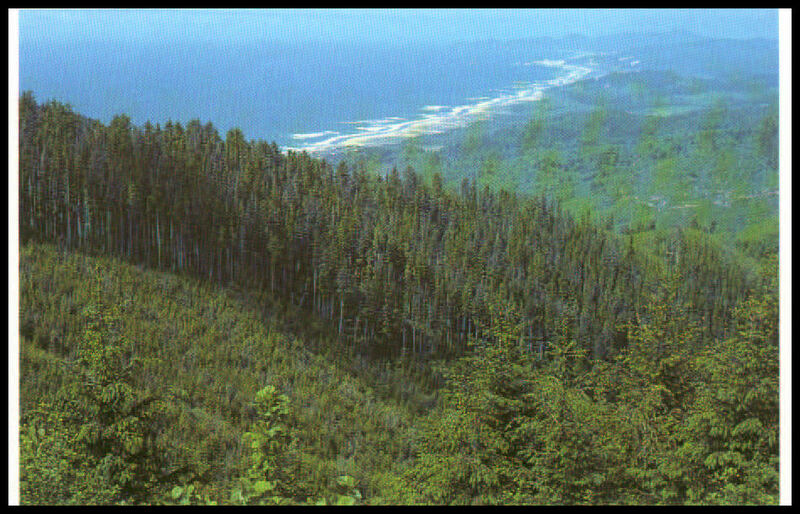 Few regions of the world support vegetation that grows faster, more densely, and to greater heights than that along the Oregon coast. The mix of species and the structure of plant communities vary greatly, even over short distances, because of site-to-site differences in elevation, climate, geology, soils, and nutrient availability. Drought is not a problem along drainages where the soil is constantly wet and air humidity is high, but plants may suffer from lack of water on a sun-warmed hillside in midsummer. Most coastal soils are of medium texture, moderately deep, and reasonably well supplied with nutrients. Along Oregon’s northern coast, the vegetation is mainly of the same species seen in coastal Washington, British Columbia, and Alaska: Sitka spruce, western hemlock, huckleberry, salmonberry, and salal (see "Appendix" for scientific names). Along the southern Oregon coast, the species mixture is much richer-the "northern" species mix with California plants growing at or near their northern limits: redwood, tanoak, California laurel, western azalea, and blueblossom. The Klamath-Siskiyou Mountain region of the southern Oregon and northern California coast supports still other localized species such as Port-Orford-cedar. The Oregon coast landscape was disturbed periodically long before human habitation. Floods and landslides are part of the natural geological aging of coastal mountains. Windstorms and wildfires set by lightning destroy vast tracts of forest. We may think such events now are unusual and catastrophic, but in fact they are very much a part of the natural cycle of events. After human settlement, additional massive changes in vegetation occurred. People frequently cause wildfires or convert large areas to agriculture and urban uses. The native forest of the Oregon coast has undergone intensive commercial exploitation only in the past century, so biological stresses are probably less than in much of the world. Here, forest managers still have time to benefit from the long-term experience of others. And here especially, forest scientists and resource managers have the opportunity to work in concert in developing sound management systems that can also be models for achieving the recovery of declining forests elsewhere. Figure l.2-The coastal zone of Oregon extends from the crest of the Roast Range to the continental Shelf. In the following chapters, we synthesize existing research information and offer some hypotheses and conclusions based on current knowledge. We offer this information and our interpretations for consideration by forest managers and others interested in long-term forest productivity.